This one is about a month behind. 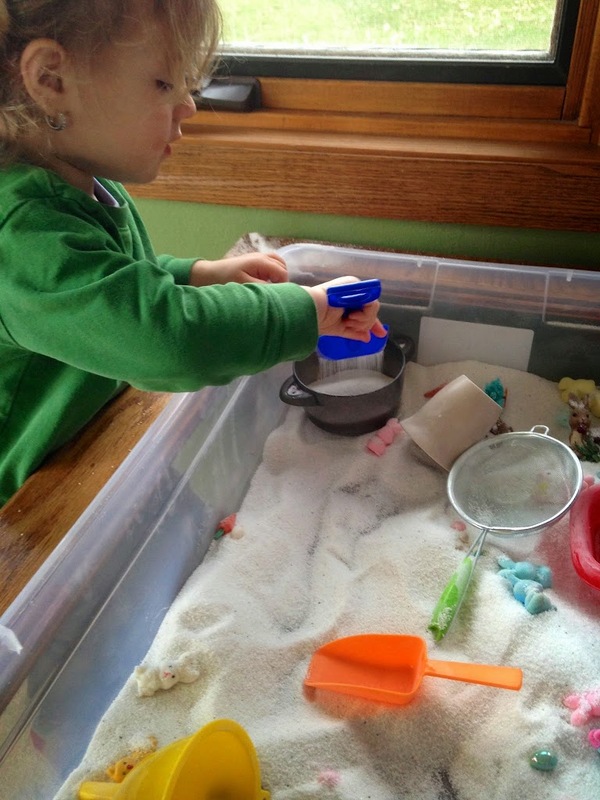 But, I am sharing it anyway mainly for the purpose of how much fun sand can be in a sensory table. Elliette literally played at this table every day for at least 30 minutes. One day it was almost an hour! And she rarely sits still. Ever. Sand is so much fun and also very messy. So, you are warned. I got this sand at the Dollar Tree, but I also have another bin with sand I found at a rummage. I used white this time for the Easter season filled with bunnies, chicks, crosses, and birds. All of her sand tools are mainly from dollar bins at our local pharmacy. Basically kitchen scoops and strainers and some funnels. And she stole a few pots and pans from her play kitchen she got for her birthday. I would hold multiple things up and prompt her to scoop sand into one so it would drain into the other and back into the bin. Endless fun. And also a good one for outside if you don’t want sand all over your floor. It does takes some work to make sure it all gets cleaned up.